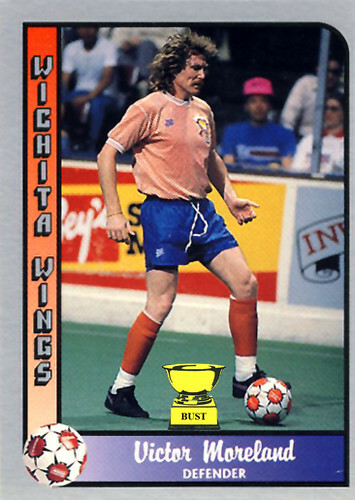 Uncharted territory: This is the first soccer card we here at The Bust have gotten our hands on and, to be honest, we're not all that familiar with the rules and customs of the sport. But rather than do research, which would take both time and energy, we're just going to assume some things based on what's seen here in this card. In soccer, it is considered bad form if the pieces of a team's uniform go well together aesthetically. In soccer, both haircuts and using shampoo are banned during the course of a player's career. In soccer, defenders are allowed to gain a psychological advantage by wrapping their exceedingly long drawstrings around their bulge. In soccer, it is permissible for players to wear clothing the color of Creamsicles and fans to wear hats that Stevie Wonder can see. In soccer, the field is tilted toward one goal in order to help the team with the stiffest white guys score easier. In soccer, as in baseball, bushy mustaches rule.